EXPERIENCE NEW ADVENTURES AND EXPLORE UNDISCOVERED WORLDS! Have you ever dreamed of swimming like a dolphin or wondered what it feels like to glide through the ocean just holding your breath? Then, you owe to yourself to find out more about the SSI Freediving Program, where you will learn to freedive at your own pace! Freediving promotes health and fitness everyone while enjoying the amazing views and serenity of the underwater world. Whether it is 5 meters (15 ft.), 15 meters (50 ft.) or well beyond, Freediving is accessible to all ages of water sport enthusiasts. Freediving gives you total freedom underwater to move like a fish in a completely natural way. You will be able to enjoy nature in its purest way and you will discover a complete new feeling in total silence without breathing noise or heavy equipment. eLearning is a general term that describes the entire battery of training and education using the power of the internet as the primary medium for knowledge acquisition. eLearning is now an integral part of obtaining a college degree in almost any subject, including accounting, engineering, mathematics, and many other subjects. 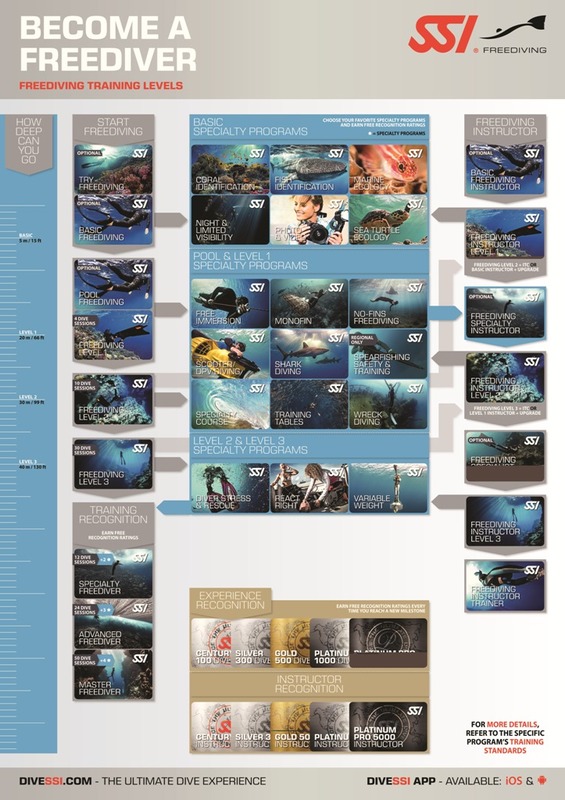 The PADI eLearning program you are now exploring or considering is simply the application of these same internet techniques to the subject of scuba diving certification. While no agency or training school can teach you to dive on the internet, the PADI eLearning program provides you with the most interactive, media-rich home study option available for the development of the academic knowledge necessary to continue to the water skills development portion of your diving class. Using the PADI eLearning program, you advance to your Dive Sports confined water and open water class segments with full confidence that YOU number among the most academically prepared students in any scuba diving class, anywhere.